In Ontario, the provincial government is responsible for setting the overall policy, laws and regulation for the child care and early years sector. Meanwhile, the Ministry of Education licenses childcare centres and home care agencies (which contract home-based childcare providers). The ministry also carries out inspections and follows up complaints about licensed and unlicensed childcare. From 2018, child and family programs funded by the government are part of an integrated system of services and supports for children up to age six and their families, says the Early Years and Child Care Annual Report 2017. The report also gives detailed snapshots of the sector. The Ontario government invests about $1 billion each year on childcare and learning. The Ontario government released its early years policy framework in 2017 – and it’s just three pages. 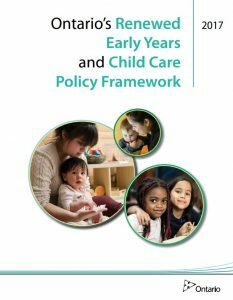 The vision of the Renewed Early Years and Childcare Policy Framework (here) for all children and families to have access to a range of high quality, inclusive and affordable early years and childcare programs. The services need to be child and family centred and contribute to children’s learning, development and wellbeing, says the official government website. The renewed framework highlights its strategies for affordability, workforce, special needs as well as an innovation fund, one-stop online hub and commitments to enhance inclusion and quality. Early learning services and educators will get more detail by delving into the 52-page document, How Does Learning Happen? Ontario’s Pedagogy for the Early Years, issued in 2014. This is the professional learning resource, which works as a guide for learning through relationships with young children and families. It supports pedagogy and curriculum/program development in early years’ programs. It sees children as “competent, capable of complex thinking, curious and rich in potential”. The emphasis is on relationships and it covers children up to age eight. You can also gain more insights into the early learning sector through Building a Better Future: A Discussion Paper for Transforming Early Years and Childcare in Ontario. It was the document circulated for public discussion before the renewed framework was issued. Ontario’s government started rolling out its Best Start Plan in 2004, inspired by the recommendations from the 1999 report, The Early Years Study – Reversing the Real Brain Drain. Then, in 2006 Dr Charles Pascal’s major consultation on early learning in the state led to his report, With Our Best Future in Mind: Implementing Early Learning in Ontario – here. It set down a curriculum and pedagogical framework, Early Learning for Every Child Today (ELECT. PDF here), released in late 2006. What’s distinctive about it compared to other provinces is this principle of the framework – “[that] knowledgeable, responsive early childhood professionals are essential”. Best Start Child and Family Centres, the Early Learning program and Extended Day Primary Programs use this. The curriculum is specific to learning outcomes for full day early learning programs for children aged four and five. It covers domains such as physical, social, emotional, communication/language and cognitive. ELECT defines curriculum in the early years settings as “the sum total of experiences, activities and events that occur within an inclusive environment designed to foster children’s wellbeing, learning, and development and ensure meaningful participation for every child”. The Child Care and Early Years Act, 2014 (CCEYA) came into force in August, 2015. It replaced the outdated Day Nurseries Act (DNA) and set down new rules governing childcare in Ontario. It applies to licensed childcare centres as well as those unlicensed, home childcare providers contracted by a licensed agency and licensed home childcare agencies. It also gives staff ratios for licensed childcare centres. Licensed providers should have a program statement that’s consistent with the Minister of Education’s Policy Statement on how learning happens. There’s a more reader-friendly document that unfurls from that here: How Does Learning Happen? Ontario’s Pedagogy for the Early Years, issued in 2014. Founded in Culture: Strategies to Promote Early Learning Among First Nations Children in Ontario (here) cites researchers Rasmussen and Toulouse who say Aboriginal people are visual-spatial learners who prefer a holistic framework of understanding that is reflective and collaborative. The document details 10 strategies including understanding Aboriginal history, culture and social contexts, creating a welcoming environment and building relationships with parents, families and extended families.